This comedy from 1940 still holds a lot of good chuckles today thanks to a great witty script and acting talent. Katherine Hepburn leads this comedy as a rich woman on the eve of her wedding when her ex-husband arrives at her mansion with two reporters in tow looking for a potentially scandalous story for their demanding editor. What follows is probably the last thing she expected. I am often proud that a film’s age seldom bothers me, but it has happened before, and even with a 1940s film (A Brief Encounter, terribly stiff and un-relatable experience) but I am happy to say that The Philadelphia Story is not one of those exceptions! I very much enjoyed it. A colossal cast for its time, Katherine Hepburn, Cary Grant and James Stewart (despite being before some of their biggest movies, The African Queen, North by Northwest and It’s a Wonderful Life respectively, they still each had a long list of films to their name by 1940s) it is probably a guarantee that this film would be a success in the acting front! Hepburn plays Tracy Lord, at the centre of the story she is an aloof Lady of the house, a huge mansion that our outsiders are promptly terrified of, yet she is hopelessly insecure. She’s marrying George, a man who wants for nothing but to please her. James Stewart plays Macaulay Connor, one of the two reporters who are quickly overwhelmed by Tracy’s guile and cunning; spinning a false pretence to prevent them from scooping a story about her father. He steals the show by the end of the film, being at first coy and awkward to becoming one of the key players in the story. I don’t want to tell you too much of what happens. As you can imagine, the story is fairly involved for what is a romantic comedy, with conflicts of passions and motivations playing against a ticking clock as the wedding looms. 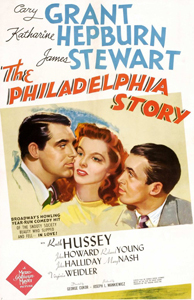 But unlike modern romantic comedies, The Philadelphia Story has a slick wit about its comedy, a constant state of inward chuckling that is personified by Cary Grant’s Dexter, Tracy’s ex-husband, who enjoys watching others fall over her whims while quietly holding all of the secrets for himself. Not in a devious way, just as an amused spectator. So with Grant, Hepburn and Stewart delivering the crisp, witty dialogue without fault (another comparison with today’s comedy: this film’s lack of edits and cuts!) means once you get involved with these characters and their relations are all setup by the thirty minute mark, it is just an enjoyable afternoon watching them verbally scratch each other with intelligent retorts or terrific tirades. The comedy and the language is still relatable today and doesn’t feel too dated, making it extremely accessible still! Plus, there’s some great drunken acting. It isn’t overblown and ridiculous like today’s standards, it is honest and tipsy-drunk, very well written and acted! Perhaps the only thing I could find nit-pick worthy was the character of George, played by John Howard; he felt side-lined, mostly used as a device to stir up the others more interesting developments. He doesn’t have a chance to prove why he and Tracy are together; there is very little setup between the two, making it quite unbelievable and making the finale not terribly surprising (in some regards, at least). I suppose with such a powerhouse cast, one can stand out. I definitely enjoyed it more than I thought I would, going into it more or less blind. It took a few minutes to become invested, but once I was on board with the characters I was happily sitting with my eyes glued to the screen. It was all in the script. Additional Marshmallows: This film was suggested for review by Cinema Cocoa follower Isobel, who guessed my film related picture question correctly over Facebook and Twitter! I will be holding more of these little challenges, posting through those channels, and the prize is always to have your say as to what gets reviewed next! So please, follow Cinema Cocoa and see if you can guess the next challenge first!